This article seeks to give a short summary of the wealth of information members provided to us through two recent surveys in relation to Workload and Students/Probationers. The full outputs are too lengthy to detail here but are being used to inform discussion with key players in Scottish education and, where appropriate, elements have been provided to National Council members to assist with engaging local authority colleagues in conversation about the key issues arising in each area. This survey repeated a survey done in Spring 2016. It asked questions about working hours, key challenges, desirability of headship and stress. More than 1000 responses were received which, while still a self-selecting survey, offers a good picture of the lot of members in various roles. The key headline items highlighted by the survey are set out below. The first was that average reported working hours for members had increased from last year to this. We went on to ask what would make the job more manageable. The top seven items raised were very similar to last year. The ‘new entry’ on the list was ‘Proper support for inclusion/adequate support for ASN pupils’ which was of little surprise as many members have reported difficult situations where some pupils introduced to mainstream schools have not come with the required additional support which diverts a considerable amount of management time both in terms of seeking that support but also through school leaders stepping in to fill the gap until the support is forthcoming. It is clear that there is still a big gap between the number of teachers required to deliver education as expected and the number of teachers available – for core teaching staff, supply staff and cover to provide teachers with non-contact time. Many of the other issues flow from that staffing/time pressure. It is immediately obvious that items 1, 2, 3, 5, 6 & 7 could be seen as different facets of the same issue (e.g. if there was less time spent in class by the SMT then there may be less calls for additional management time or posts – or vice-versa). In short it is a strong message that the resource currently available in schools falls well short of that required to deliver on the expectations currently placed on school leadership teams. We also asked members to explain their views about seeking headship (or recommending headship if already a HT). Responses in this section didn’t paint a very positive picture. The short summary of what this tells us is that the continuation and apparent worsening of the challenges faced by heads alongside increased pressure for deputes and PTs continues to reduce the desirability of headship. 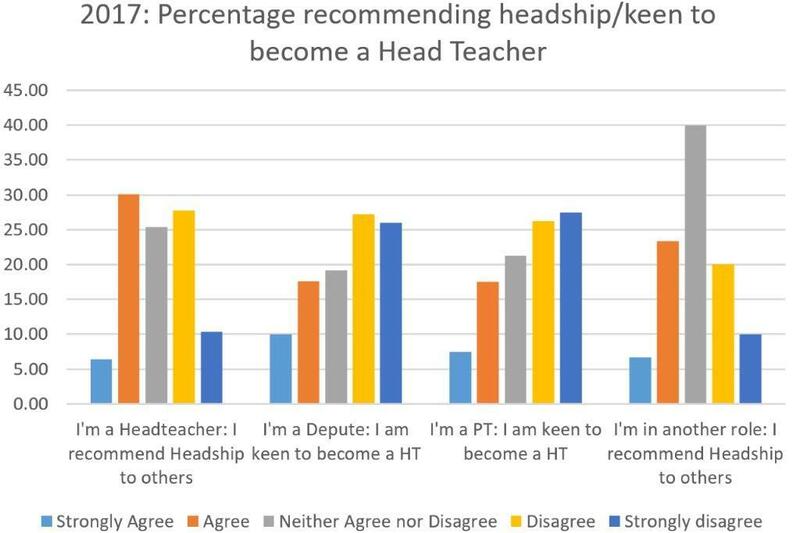 The graph below sets this out but we need to bear in mind that the recruitment to Into Headship has been relatively strong so far which suggests a different landscape than that suggested by our sample. Clearly some indicators have improved while others have worsened. Four out of seven indicators suggest a negative situation with the Demands indicators having by far the worst score, one which worsened in the 2017 returns. This very much reinforced the information gathered in the early sections of the survey about numbers of hours worked by members and the tasks which they feel make the job of school leader less manageable. AHDS National Executive and Council have been considering the information gathered and it will be used in meetings and correspondence in an effort to address some of the key issues raised. Once again, we would like to thank those members who took the time to engage with this survey. Another survey completed earlier this year related to member experiences of students and probationers in recent years. This survey was conducted due to increasing numbers of members saying that recent experience of students and probationers had been less positive than was the case a few years ago. The outputs suggest that this is not a perception shared in only a few isolated situations but one which registered with a more significant number of members. The survey was a quick attempt to gather the perspective of members on this important issue. There were more than 400 responses within a week which highlighted that this was a real issue in the eyes of these members. However, the survey responses had a clear limitation in that they could not tell us the reasons for the perspectives expressed. While members were having a less positive experience with students and probationers it was not possible to determine from the information gathered whether this was due to lower calibre student intakes, some change in ITE provision or due to staff shortages in school leading to school leadership teams having less time to support and develop emerging teachers. Member feedback has been shared with key partners in groups working to improve initial teacher education. We will continue to engage in these groups with the common goal of ensuring that our new teachers are as good as they can be.